No longer limited to central or federal government agencies with large budgets, video conferencing and telepresence solutions are quickly transforming the way state and local government agencies communicate. With costs coming down and reliability having improved, government agencies are using video to reduce travel, increase productivity and implement sustainable IT practices. 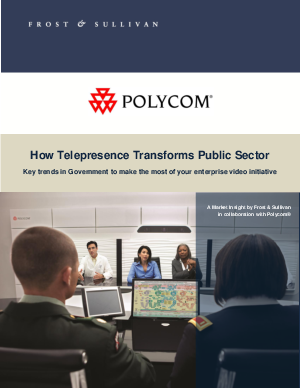 Download this Market Insight brief from Frost and Sullivan in collaboration with Polycom® for a detaild overview of the key applications of video collaboration in the public sector.